Parrots pull themselves from branch to branch using their strong, curved beaks as well as their feet to hold on. Because their first and fourth toes are turned backwards, they walk funny, but they are great climbers. There is even a kind of parrot that only comes out at night and can’t fly at all: the Kakapo. They are the world’s only flightless and nocturnal (nock-TUR-nuhl) parrots. They get to their food (fruits and seeds) by climbing trees using their feet and beaks. Most parrots have powerful bills built for crushing even very hard nuts. They hold the nut up to their beaks and use the raspy edges to saw and chisel away at the shell till they can pry it open and pull the nutmeat out with their muscular tongues. Parrots also eat seeds and fruit. One of the smaller species, the rainbow lorikeet, laps up flower pollen and nectar with its bristly tongue! 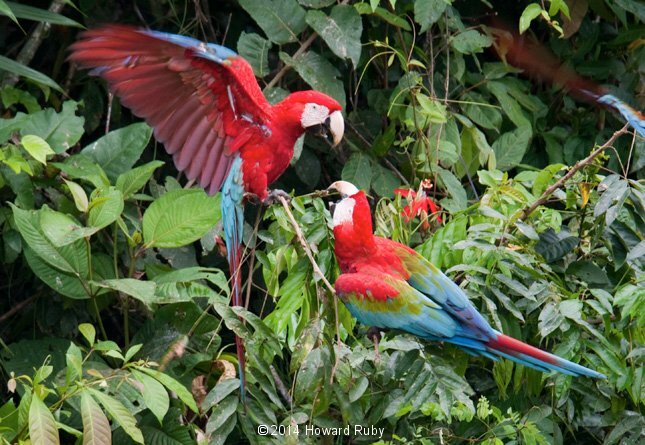 Many of the parrots that live in the rainforest around the Amazon River eat a special kind of clay. They come every few days – and some as often as every day – to eat from a particular layer of riverbank clay. Scientists found that the clay has special properties that allow it to bind up the toxins (poisons) that the birds eat when they crack open certain rainforest nuts and seeds. This lets the birds pass the toxins through their digestive systems without being affected. Parrots live in flocks and like to have mates of their own. Even within the flock mates will stay near each other. They eat together and groom each other’s feathers. A flock of parrots can make a lot of noise squawking and chattering together! A mated pair will choose a nest – most parrots nest in holes in trees. Desert parrots nest in holes in cactuses instead! Monk parakeets weave sticks into nests that can weigh hundreds of pounds, and often several families each have a hole in the nest – a parakeet apartment house! Mom lays the egg – up to three – and stays inside with them till they hatch. Dad feeds her during the wait. Even after they’re out of the nest and fully feathered, the young parrots are not able to take care of themselves, and stay with their parents until they can – sometimes months later. Of the more than 300 species of parrots in the world, nearly 100 are threatened in the wild due to hunting, the illegal parrot trade, and loss of habitat due to deforestation and climate change. Many conservation groups are working hard to protect these beautiful birds.